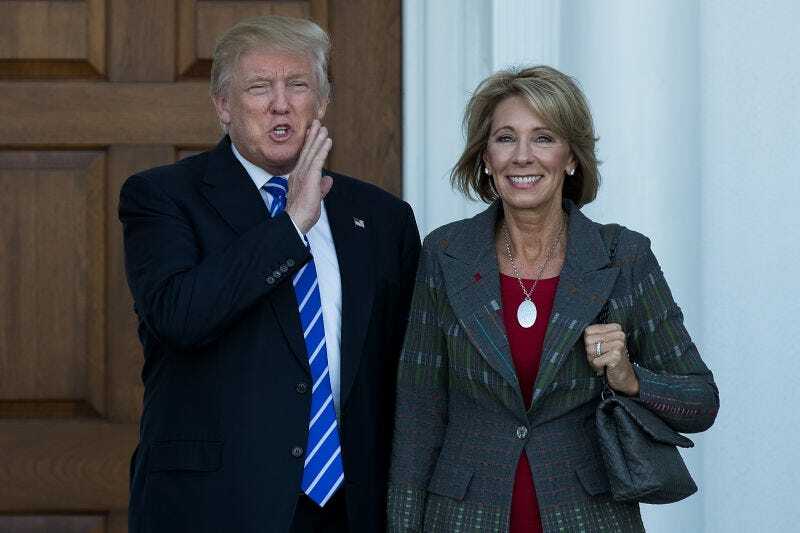 Betsy DeVos is a longtime billionaire philanthropist, a champion of allowing religion in schools and a charter school board member who was picked by President-elect Donald Trump as his nominee for secretary of education. She has never worked in a school or been in the field of education before, and while she has considerable money on her own, she also married a co-founder of Amway. Suffice it to say that someone with no educational experience would like to run the Department of Education, much like a businessman wants to run an entire country. The confirmation hearings were disastrous, with DeVos trying to keep up with the questions and offer answers that made it seem as if she knew what she was doing. It’s difficult to know where to begin, but the education community is buzzing about how little she understood Sen. Al Franken’s question about the advantages of assessments in measuring growth or proficiency. DeVos didn’t know she was walking into an area about which she knew nothing. Educators understand the difference between measuring for growth and measuring for proficiency, and we know that those not in that space may not see how dire it is that the person who wants the position of education secretary have a cursory understanding of it. As an educator, I spent 10 years as a classroom teacher and three more as a literacy coach at a middle school before I became a school administrator for 10 more years as an assistant principal and guidance dean. Even with all that background, I do not feel qualified to lead the Department of Education because I haven’t yet spent time in think tanks or working with policy or in higher education, but that still makes me more qualified than Betsy DeVos. It should be telling that a person with two degrees in education knows enough to know that she wouldn’t have the necessary background for education secretary, and yet that didn’t stop Trump from naming DeVos. Several years ago, a family of 16 walked into the middle school where I worked. The school year was in full swing, but the father of the family needed to register four of those children in our school. The mother in the family had recently passed away and the father had no choice, according to him, but to split up the rest of the kids between himself and an older sister. When asked about the late registration, he told us they had “home-schooled” the children their entire lives. None of them had ever attended a public school. Even with all that background, I do not feel qualified to lead the Department of Education because I haven’t yet spent time in think tanks or working with policy or in higher education, but that still makes me more qualified than Betsy DeVos. I use the term “home school” very loosely here, since it became evident that very little learning had occurred for these children. The father was guessing as to their grade levels (this was a major red flag for us) and suggested that two of the kids belonged in eighth grade and that the other two were in sixth and seventh. Our literacy protocols dictated that we assess them using basic reading measures, and when their grade-level assessments were too much, I went back a grade level until they could accurately read them back to me. One of the boys worked his way back to the kindergarten test (which I had to access from an elementary school friend) because he couldn’t recognize all 26 letters of the alphabet. He guessed as I pointed them out. Only the girl (the rest were boys) was able to read to me, and that was at the fourth-grade level because, as she told me, she was required to read recipes for the family, so she was one of the better readers. DeVos would know, if she were an educator, that this is an issue between growth and proficiency. She has not, however, ever worked in a school; nor did she or her children attend a public school, which is crucial, considering that she knows what’s best for public schools and wants to rule over them with the job. Her background is as a billionaire philanthropist who has donated to or served on the boards of several charter schools. If she were a professional in the field of education, DeVos would know that these nonreaders we had enrolled would take a state-mandated assessment and get a score that would affect the overall score of our school. She would know that enrolling them with such low reading levels meant that when they failed abysmally on those tests, we would take a hit from the scores because we measured them for proficiency, which is an arbitrary level the state assigns. What we wanted to do was measure them for growth so that the boy who didn’t recognize letters in November would be able to do so by the next assessment. Teachers and schools want to measure for the growth we’re responsible for so that there is a clear “this is where you are now” compared with where students were when they came to us. Schools get punished in the proficiency model, and that’s no accident. Many proponents of charter and private schools like to see public schools listed as “failing” because this fits into the narrative of education reformers who would like to make money off of children by removing them from the so-called failing schools. DeVos, with her limited charter school background, would know this is how you get them to fail, but she’s not even up to speed with that. In a statement, she said, “The status quo in education is not acceptable.” How would she know that if she doesn’t understand the growth vs. proficiency debate? This appointment will likely be disastrous for black students on whom many charter schools prey as they plant themselves in areas where they know desperate parents hope for an education miracle. A report from the National Assessment of Educational Progress shows that Betsy DeVos’ own state of Michigan continues to have a gap in student progress between African-American and white students, significantly larger than the national statistic. DeVos’ home state, over which she’s been influencing charter school policy, is the fourth highest in American school segregation, a fact that discloses that she’s already had an opportunity to make a difference in the schooling of black students and has done a dismal job of it. Why would we give her more oversight to include the other 49 states as secretary of education? Betsy DeVos is the wolf in sheep’s clothing who plans to make money off of those children. We really shouldn’t cut her any slack on her poor interview skills, since this will likely be her very first job. Kelly Wickham Hurst is a 23-year public school veteran as both a classroom teacher and an administrator in guidance, dean and assistant principal roles. Her work has primarily been in the middle and high schools, and she’s written about education and race and single parenthood as well as other social-justice issues since 2005 on her blog, Mocha Momma. In 2016 she created Being Black at School to help advocate for black students both in schools with educators as well as for parents raising black children. She is the married mother of six and lives in Illinois.